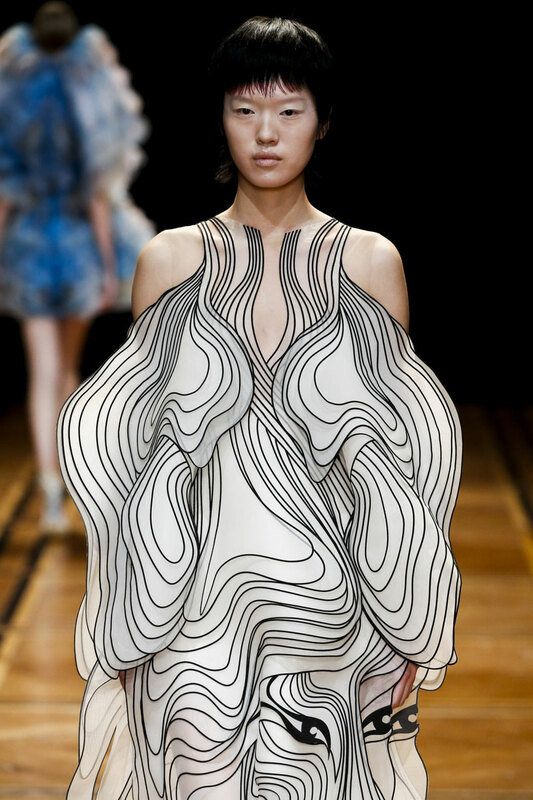 dutch designer iris van herpen takes inspiration from celestial maps and outer space galaxies with her latest collection, which she describes as an ‘evolution of the human shape’. 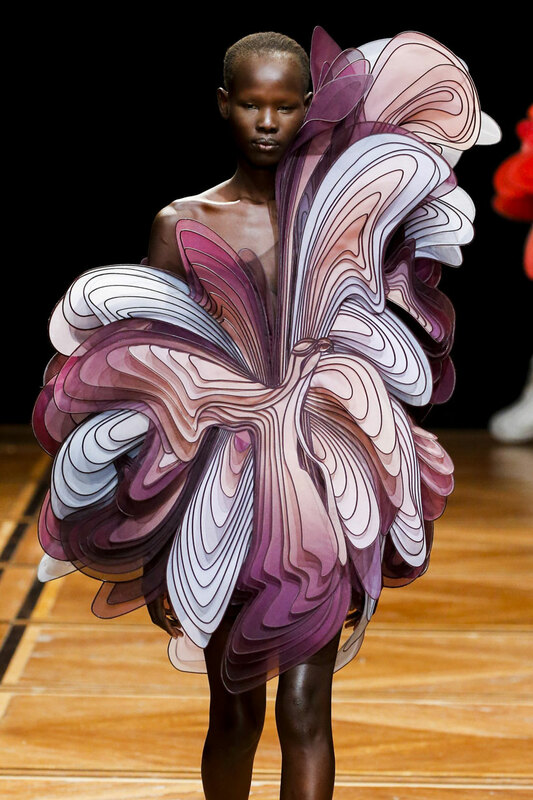 herpen’s latest haute couture collection titled ‘shift souls’, presented at palais des beaux-arts in paris, features eighteen looks with ‘concentration on dissected and voluminous layering’. 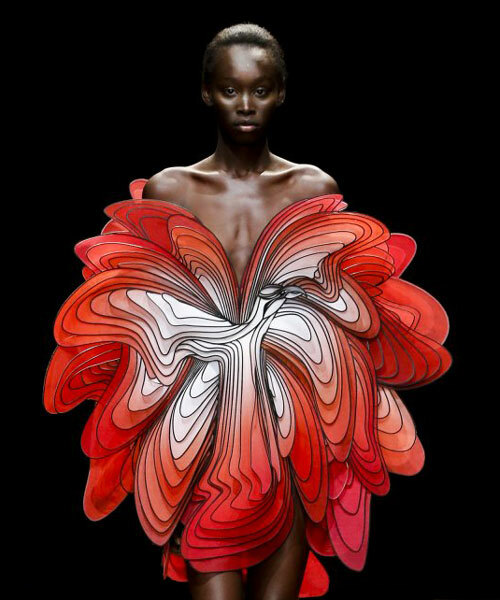 offering a glimpse into the future, the amsterdam-based van herpen achieves the perfect mix of technology and creativity. she sites the harmonia macrocosmica (a 17th-century star atlas) and the possibility of engineered human hybrids as her inspirations. 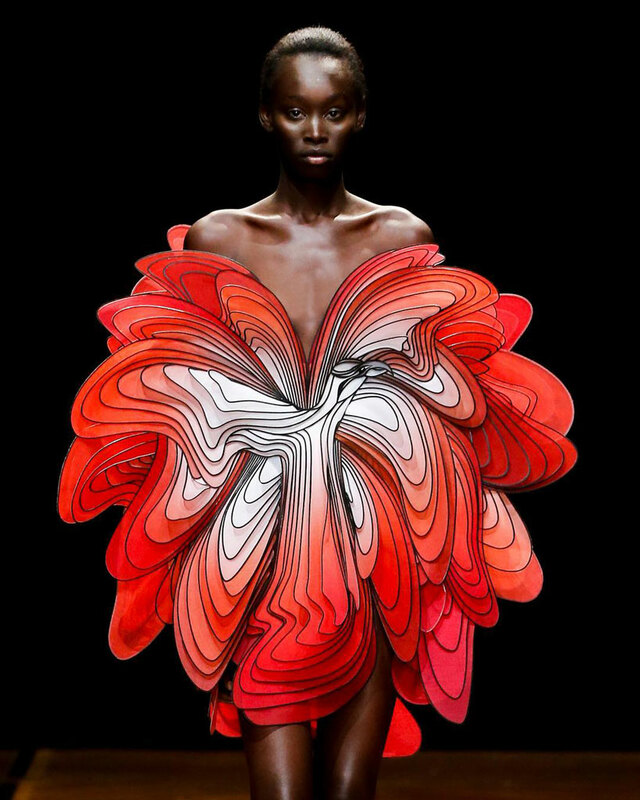 her experimental approach sees a collection of 3D printed, laser-cut, algorithm-defined pieces. the ‘symbiotic’ volumes are made from gradient- dyed silks that are multi-layered into sculptural shapes by a fine 3D lasercut frame of PETG to create hybrid bird shapes in dimensional color gradations that hover in symbiosis with the body like mythological creatures. 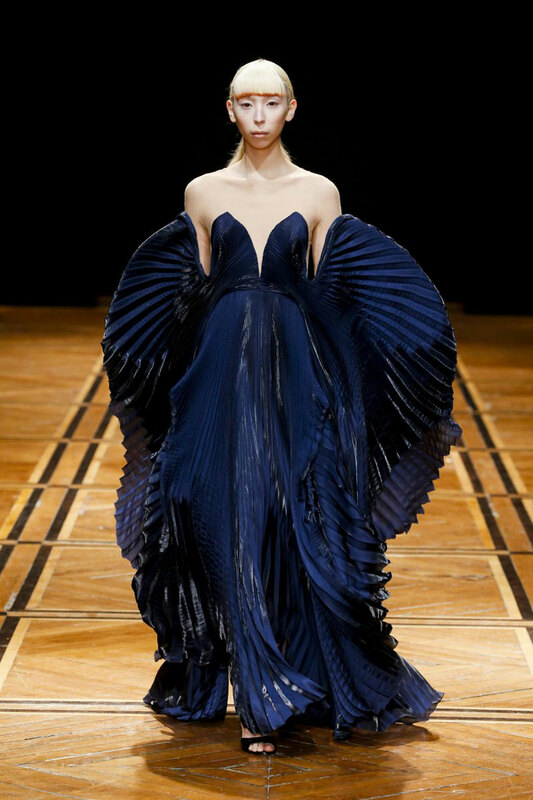 known for her stony, metallic hues, herpen went for a multifarious palette of ochre, tyrian purple and indigo. 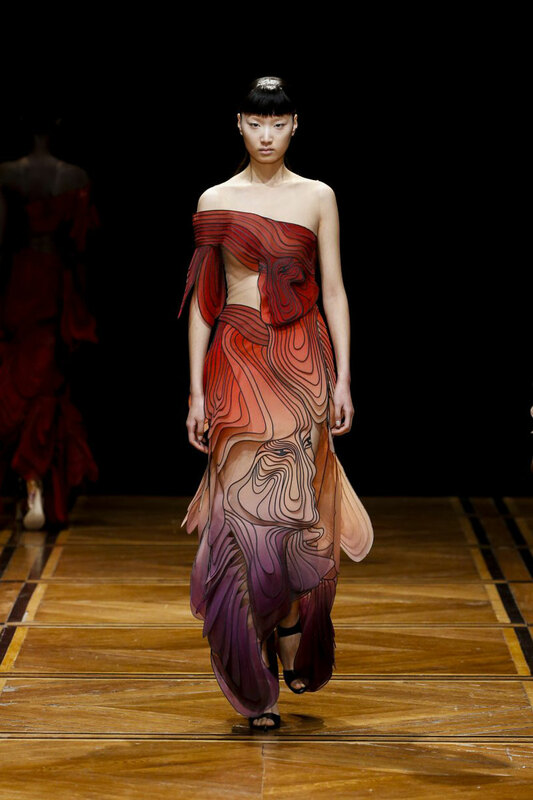 kinetic patterns and swirling body topographies in layers of gradient-dyed silks form sculptural shapes. 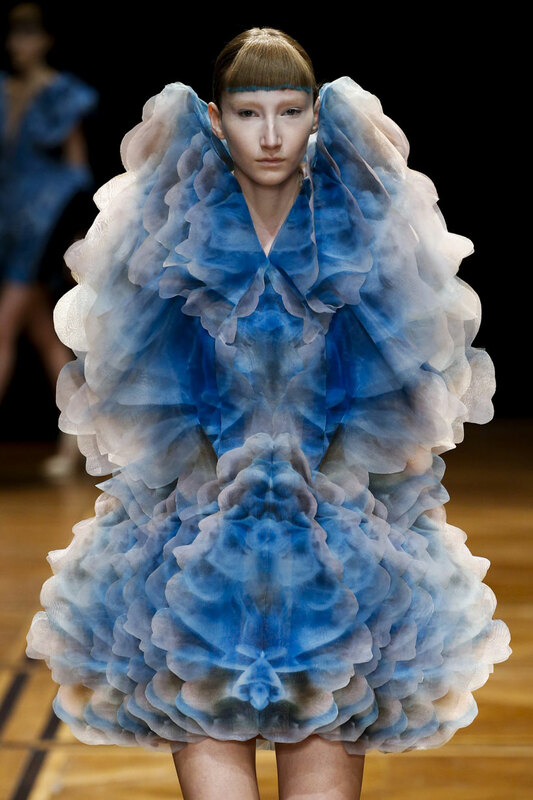 additional inspiration came from new york-based artist and former NASA engineer kim keever with whom van herpen collaborated with on a cloud-like dress. 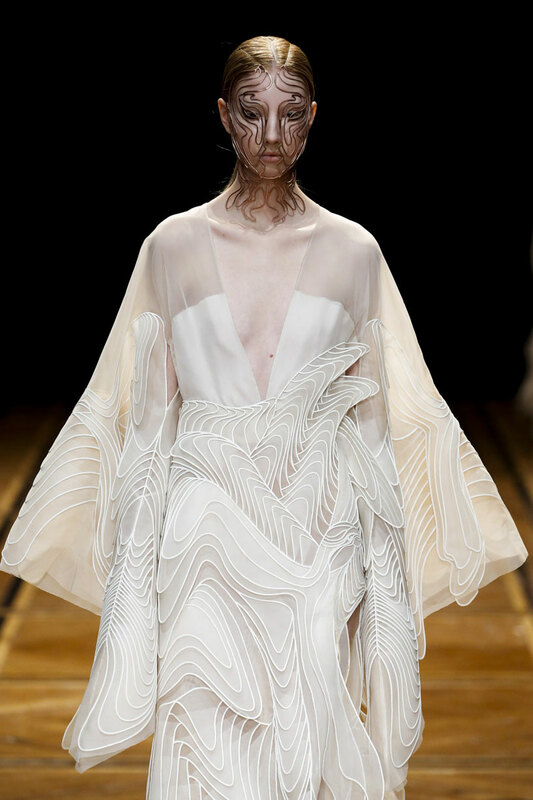 the title piece of the collection is the ‘shift souls’ dress featuring layers of white silk panels which have been heat-bonded to three-dimensional drawings. lasercut of black mylar and cotton, these illustrations hide and reveal anamorphic faces, creating surreal spectral anatomy. another highlight in the collection is the ‘symbiotic’ dress made from gradient-dyed silk panels of shuiro red and white, creating a hybrid bird pattern. 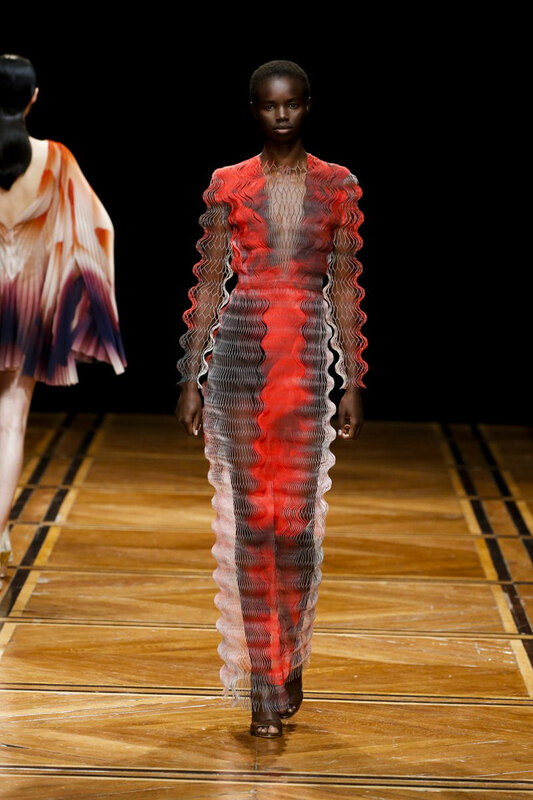 for the finale of the show, iris van herpen collaborated with contemporary artist nick verstand, subdividing the space using walls of materialized laser light, revealing a dreamscape of circulating clouds. backstage she revealed that she is working on a major exhibition for an undisclosed site in paris for 2020. the designer is also working on a new book and is in the completion stages on her first big architecture project, a natural history museum located somewhere in the netherlands, which is still under wraps. ‘for ‘shift souls’ I looked at the evolution of the human shape, its idealization through time and the hybridization of the female forms within mythology’, herpen explains. ‘specially the imagination and the fluidity within identity change in japanese mythology gave me the inspiration to explore the deeper meaning of identity and how immaterial and mutable it can become within the current coalescence of our digital bodies‘.